At Troll Dolls Guide, we use Google Analytics and other WordPress plugins to monitor the use of our website, it’s traffic, most popular posts and click through and make improvements accordingly. 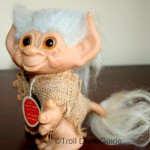 Google Analytics allows Troll Dolls Guide to receive anonymous data regarding reader’s gender, age, location and interests, as well as keyword searches to determine how they found our content. This data is in presented in an anonymous and non-identifiable format. We use the data collected to make improvements to Our Site, ensure it remains user friendly and keeps providing the information you want to see. If you chose to subscribe to Our site, you may receive our newsletter, as well as periodic emails about information we feel will be of interest. We do not pass any of your data on to third parties except in the extremely rare event that we are required by law to do so. All the information on this site is exclusively owned by me, and may not be copied, reproduced, distributed or shared in a way in which it would suggest that it belongs to anyone other than myself. Quotes may be extracted from content on this site in the event that explicit permission is sought from me, and adequate credit is displayed. Troll Dolls Guide loves hearing our readers views and feedback, and as such, Our Site allows comments to be added beneath our posts. The information collected here, which includes names, email addresses and/or website URL’s will not be added to our mailing list and will not be passed on to third parties. We use traffic log cookies specifically, in order to identify which pages of our site are visited most regularly. This helps us collate data about our site’s traffic and use this information of statistical purposes. A cookie does not give us access to your computer and does present us with any additional personal information other than what you specifically chose to share with us. Should you prefer not to allow cookies, you can decline all non-essential cookies using the pop up which appears on Our Site. This however, may prevent you from having the full site experience. This website maintains an email mailing list to those who have chosen to subscribe to our newsletter, distributed via MailChimp. This newsletter will contain brief summaries of our most recent posts, ensuring you don’t miss any content you might enjoy. Should you wish to read the posts in full, you can then click through to Our Site. The email addresses collated when users opt in and subscribe are used for the purpose of this RSS based newsletter, as well as occasional updates or promotional content. Your email address from our mailing list will NEVER be passed on to third parties and you are free to unsubscribe at any time by clicking the unsubscribe link at the bottom of your emails. www.trolldollsguide.com does not knowingly collect any personally identifiable information from children under the age of 13. If a parent or guardian believes that www.trolldollsguide.com has in its database the personally-identifiable information of a child under the age of 13, please contact us immediately (using the contact us button in the menu) and we will use our best efforts to promptly remove such information from our records.